The Sacraments mark spiritually and in some symbol and ritual forms, the different stages of our lives. At St Catherine’s these are carried out according to the Rites of the Church of England, using its liturgy. Background information can be found on the Church of England website. At Baptism children and adults are welcomed into the Christian faith and into the worldwide Church. Baptisms will, for the most part, happen as part of the usual Sunday morning service. Very occasionally, and at the Chaplain’s discretion, this service will not be a Eucharist. For Baptism we welcome people at any stage in life, as long as they have not been baptised already elsewhere. 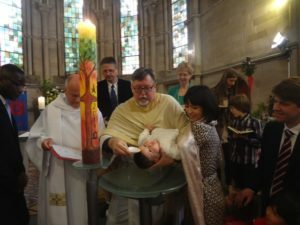 Occasionally there are special circumstances – including an adoption, a traumatic birth, and other examples, when Baptism may not be immediately appropriate. Once again please make contact with the Chaplain to discuss a wish for a Thanksgiving or similar. N.B. To avoid disappointment, please do not book arrangements with godparents (especially overseas godparents) until a date has been agreed with the Chaplain. Confirmation is carried out by a visiting bishop and is a super joyful experience for everyone – candidates, their families and the St Catherine’s family too. This is an affirmation of personal faith, rather than received or inherited faith. The right time for Confirmation can be at any age or stage in life. St Catherine’s will over time offer different options for preparation for confirmation or better exploration of the Christian faith. 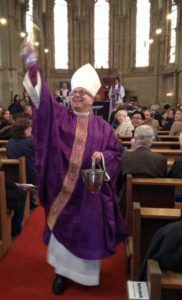 We include in this sweep any who would like to be formally received into the Anglican Communion / Church of England from another tradition, though membership at St Catherine’s requires no such formality. Couples should be aware that Church weddings have no legal status in Germany and a civil ceremony will also have to be arranged at the Standesamt. Mostly it will make sense to do this first and then come to Church for a service. 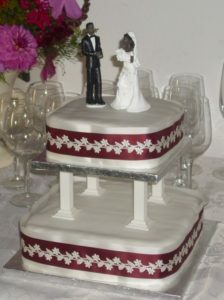 For more details of the legal aspects of getting married in Germany please contact your local Standesamt.